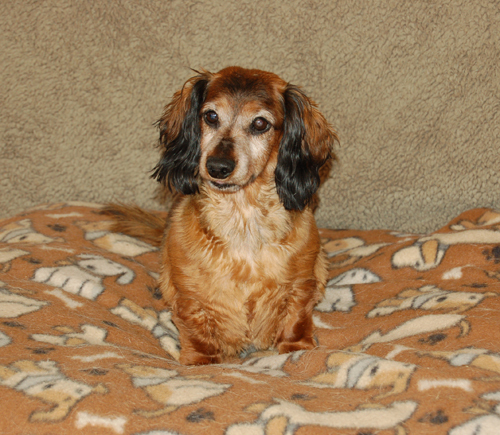 The email subject line read Sophie the doxie 95464 in need of rescue!? It came to us from a volunteer at a California shelter. 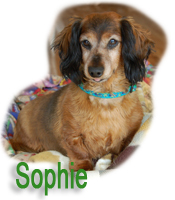 Sophie had been surrendered by her owner, who said she could no longer care for the dog. 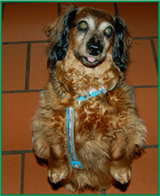 Sophie was about 7 years old, terribly overweight at 18 pounds, and yes, blind. She turned out to be adorably cute, insistently bossy, and … well, a bit eccentric. 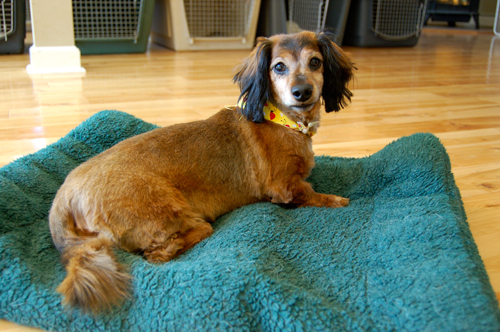 Sophie is a long-haired Dachshund who hadn’t been groomed in a long time when she arrived. She was a very plump thing on very short legs, with virtually no ground clearance. So her low-slung body and her long feathery hair combined to make her adept at lawn maintenance. Wherever she went in the yard, she swept up leaves, grass clippings and other debris in her coat, and helpfully brought it all back into the house with her. 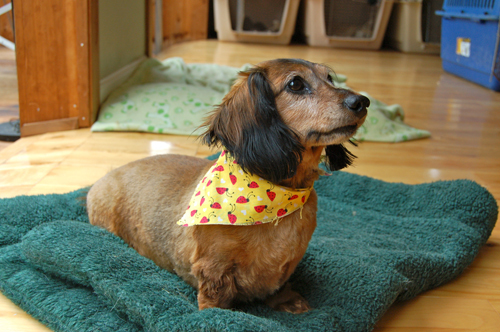 Our groomer and a long-term diet made her less effective at lawn care, and alas, the yard isn’t as tidy as it once was. She resisted her new diet, of course, and was convinced the best diet-buster plan was to sit up and beg any time food was in the vicinity. In her early days with us, Sophie was so fat it was a struggle for her to sit up at the table, but this she would do — over and over again. Often she would lean to one side or the other, like a listing ship in distress, but she never did capsize. It wasn’t just at our dining table where she?d sit up to beg for food. 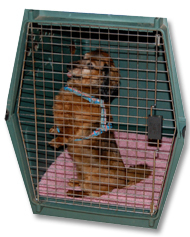 She thought this was such a productive technique that she would even sit up inside her crate, waiting for her own dinner. (We feed the dogs in their crates to avoid competition and to let everyone eat at their own pace.) Even though it never affected the amount of food she got, Sophie would still sit up in her crate, hoping to change the outcome. It didn’t even really matter which way she faced, because she just never knew which direction the Gods of Food might come from. Somewhere along the line, she decided that growling was how a girl should display affection. How she got this so backwards we?ll never know. But the more we scratch her and pet her and love her up, the more she?ll growl. She?ll even bare her teeth and curl her lip while she growls. Sophie, that’s not a pretty face!,? we?ll scold — to no effect. But what she’s really saying is, Oooh, that feels sooo good, please keep going!? Yet it sounds like, If you don’t stop, I?m going to let you have it!? Needless to say, it took us a while to figure out that this was actually love-speak on her part. Why she expresses happiness and affection in this peculiar way remains a mystery. It occurred to us that Sophie might benefit from her own version of that early 90s bestseller, Men are from Mars, Women are from Venus: A Practical Guide for Improving Communication and Getting What You Want in Your Relationships. In any case, as you can see, Sophie is a one-of-a-kind girl!